We had just had Snowpocalypse here in Georgia, so this soup was perfect. Today in my area, the low was 39 and the high was 59, so I was happy for some sunshine and milder winter temps. Still too cold for me, though. The girls and I were all bundled up to meet the bus, and they were taking turns putting their hands around my hot coffee cup. We were shivering and trying to remember how hot we were last summer; We are always wishing for flip flops, tank tops, and swim suits! Here is another great winter comfort food…Chicken and Dumplings*** I researched this recipe for almost a week. I wrote down tons of ideas and finally came up with this to try. It turned out pretty delicious, if I do say so myself. I had to do a few changes along the way, so hopefully if you give this a try, you will love it. 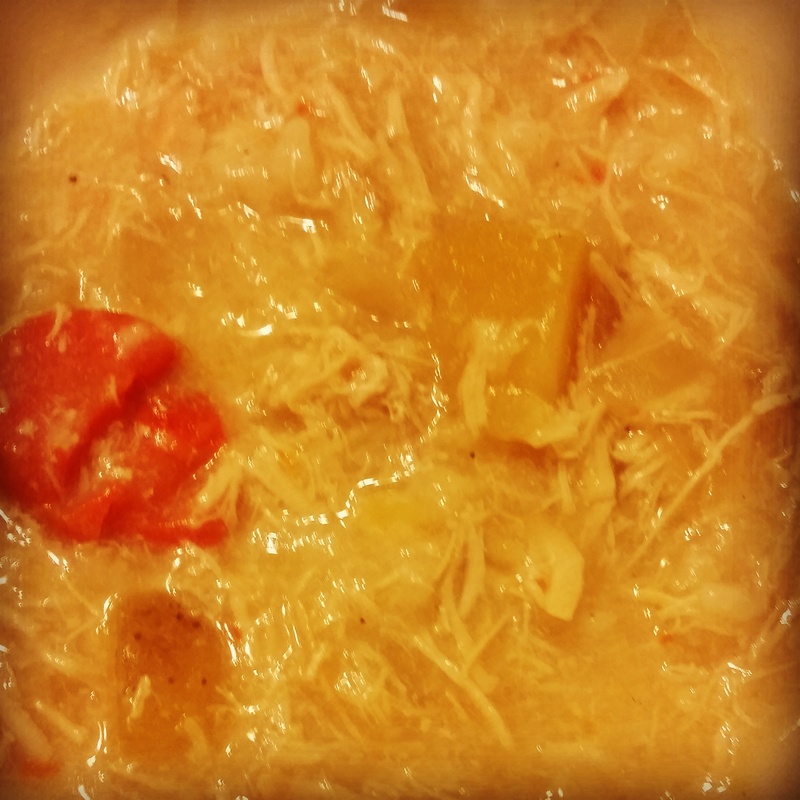 ***crockpot meals are not the most photogenic…this one is no different. Taste wins out against pretty pictures pretty much always. 3 golden potatoes, cut into chunks (or 4-5 new potatoes cut in half)- no peeling necessary (if you have Idaho or baking potatoes, I would peel and cut into small chunks). Make your homemade “condensed cream of chicken soup”. You could skip this step and the half and half that comes later and just buy a can of cream of chicken soup. Have you read the ingredient list on one of those cans? On medium heat, melt butter and whisk in flour. Cook 2-3 minutes to create your roux. When it looks like wet sand, add 2 cups of chicken stock. Stir well and bring to a boil. Meanwhile, in the bottom of a large crock pot, layer onion, carrots, and potatoes. Put the chicken on the top. Add your seasonings. Pour soup on top. You can do all of this the night before if you wish and add to your crockpot (cool the soup just a bit first before adding it to the chicken). If not, doing all of it in the am is still pretty easy. It took me less than 10 minutes to make the soup and add it. Add enough chicken stock to cover. My crockpot is kinda small, so mine was almost to the top. Heat on low for 6-8 hours. High 3-4 hours. Now… my crockpot is small, so I suggest you transfer the cooked chicken and veggie soup to a stock pot/large pasta pot/etc. after the allotted time. Stir and shred your chicken with a fork. This should not be hard at all. Like butter =) Stir in your half and half. Add in cut up biscuit dough and cook for about an hour or until biscuits are not raw in the middle.